Sorrows of a Mother: Mrs. Trumpy's Long Fight for Possession of Her Boy. A Sad History. *I wish to express my appreciation to Teresa Vega for bringing this story to my attention. In August, 1869, Benjamin F. Trumpy married Mary, the daughter of Mr. Sanford Mead, a well-to-do farmer of Greenwich. The couple were united in the last named place, but soon after the ceremony came to the city. From here they returned to Greenwich. In 1874 the wife left the husband on the ground of great and long continued cruelty. Acts of cruelty were particularly charged to have been committed two weeks previous to the birth of their youngest child. There had been for children, two of them twins, who died, and two others – Sanford and Benjamin F., Jr. Colonel H. W. R. Hoyt, counsel for Mrs. Trumpy, in the fall of 1874 filed a petition for absolute divorce. Mrs. Trumpy had possession of her two children, but shortly after Christmas Day Trumpy, with his brother-in-law, H. R. Bailey, and others, forced a way into the house of Alexander Mead, Mrs. Trumpy's brother, and took away Benjamin F., Jr., the elder boy. In 1875 the case was tried in Bridgeport. Mrs. Trumpy charged her husband with habitual drunkeness and intolerable cruelty. He made a simple denial. The case was dismissed. In the summer of the same year Colonel Hoyt and George H. Watross, of Norwalk, filed a second petition with the old charges and an additional one of adultery. State Attorney Olmstead, of Norwalk, was thereupon retained by Trumpy. On the 23rd of May, 1877, the case came up before Judge Carpenter, in Greenwich. Mrs. Trumpy was the first witness called. She testified to her husband's intoxication, acts of cruelty and brutal treatment during the first part of their married life; she said he broke his promise not to drink although that promise had gained her hand. He was even intoxicated during their bridal trip. When one of the twins was dead, and before the other had died, he wrote an obituary notice of both for the newspapers, and said it was a good advertisement for his business. On the return to Greenwich Trumpy was given a grocery store by her father. When Mr. Mead died, soon after, and left her $7,000 dollars, her husband was displeased because she loaned it to her brother on a mortgage security. He threatened to shoot her or himself two weeks before their youngest child was born. Judge Carpenter urged upon both sides the wisdom of reconciliation, on account of the children. 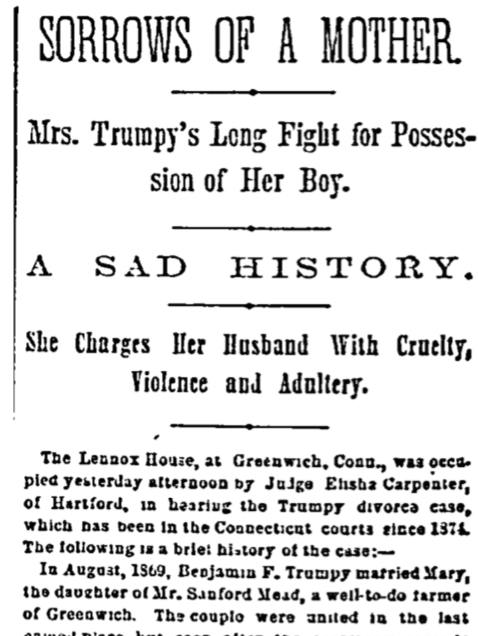 Mrs. Trumpy did not press the charges, and he consented to have an absolute divorce granted her. He was to have the oldest child, who, however, was to remain with his mother one third of the year. The youngest was to be entirely under the control of the mother. The decree was passed in June, 1877. Mrs. Trumpy went to the house of Mr. Bailey, her husband's brother-in-law, and asked the promised possession of the elder boy. Benjamin F., Jr. She was repulsed with insults. For three years he had not been with his mother, and she had only seen him once in a while during all that time. When he was taken sick his mother was kept in ignorance of the fact. Between 29th of June, and 20th of September, 1877, she visited Bailey's house about twenty or thirty times to get possession of her child, but each time was met with rebukes and sneers. At the same time Trumpy had free access to the younger boy, Sanford, who was with his mother at the house of her brother, Alexander Mead. The last effort made by Mrs. Trumpy to see her oldest boy was on the 20th of September. She was then told by her husband, it is said, that there was no use of her coming to the house as she couldn't have her child, anyway. On the 27th of September, 1877, Colonel Hoyt filed a petition in the Superior Court, which alleged the insults and reproaches heaped upon the wife and asked the court to change the order so that the mother could have custody of both of the children. On the 19th of September, 1877, and habeas corpus was filed and a writ asking the custody of Benjamin F. Trumpy, Jr. The matter rested and court for a few days, during upon which a hearing was held, and then Trumpy filed a counter petition and application for the other child. In January, 1878, Judge S. B. Beardsley, before whom the case was called, referred the matter to Elisha Carpenter, who is judge of the Supreme Court of Errors, to hear and report all the facts. The first hearing was had at the 3d and 4th of February last, at the Lennox House, in Greenwich. It was adjourned on 12th of June, and also on the 13th and 14th. The testimony showed the treatment received by Mrs. Trumpy and the unfitness of Mr. Trumpy to take charge of the children, as shown by his violence of temper and cruelty to his wife and children. On the last day two witnesses testified that Trumpy had committed adultery with a mulatto woman in his employ. The witnesses were Alexander Mead and the woman herself, Fanny Green. Alexander Mead testified that on the 4th July, 1873, he came home late; there had been company; Trumpy was not at home; he heard the thumping of a key on the outside door; Fanny opened the door and walked away; Trumpy followed her into the dining room; there witness heard Fanny exclaim, "Let me go – let me go, or I will call Mr. Mead;" witness took off his shoes and went downstairs; he heard Trumpy exclaimed, "Make less noise, I hear someone walking;" witness wished to tell this in the first divorce case, but was not permitted to do so; he never said anything to the principals as to his knowledge of the adultery; he was positive that adultery have been committed. Fanny Green testified that her name had been Spears but that she had married and lived in Hangroot; she lived in Mead's family in 1873; lived there for one year and nine months; she remembered Trumpy meeting her one night in the dining room, and it was after 11 o'clock on the 4th of July; she let the gardener him and was returning when met by Trumpy, put his arms about her; she started for the kitchen door, but was pulled back by him; she told him to let her go; he cautioned her to keep still and not make so much noise; he said he wouldn't let her go; she replied that she would call Mr. Mead; she told him to go up to his wife; he accomplished his purpose, and she told him she'd tell his wife next morning; he asked her not to; he was under the influence of liquor. The case was that adjourned until yesterday. A twelve o'clock Alexander Mead and Fanny Green, the colored women, were cross-examined. They told the same story as above related, with a few fuller explanations. They did not vary from their first statement. The mulatto is under thirty-five years of age. She is neat looking, and was quite an attractive looking girl when at Mead's. She came here from the South. She swore yesterday the Trumpy was the first man she ever was criminally intimate with. She is married to a hard-working colored man. Thomas G. Ritch, a New York lawyer, by consent of counsel, testified to the exemplary character of Trumpy; witness had seen him attending church in Stamford for a period of two years. Joseph B. Hustead testified to driving up one night from the village with Trumpy, who was intoxicated, and talked about his (Trumpy's) children; he told witness that they were sick and that if they were going to die he didn't see why they were not permitted to die; that if plots were needed this is trumpet could go up and cultivate some kittens that were in the stable. Abraham Henderson testified to getting intoxicated quite often with Trumpy. Colonel Hoyt closes his case today.